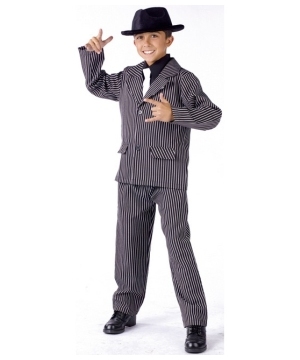 Browse our vast collection of 1920s Boys Costumes! The 20s were known as the Golden epoch with their organized crime and the classical pinstriped jackets, the flapper dress style and jazz music. Go back to the great years wearing a 1920s outfit! Enjoy a secure shopping experience and affordable prices. The 1920’s was known as the Roaring Twenties or the Jazz Age, also known as the Golden epoch for the economic boom following World War I. In those years communism began attracting a lot of supporters after the success of the October Revolution in Russia, large cities enjoyed great social, artistic, and cultural dynamism in and jazz flourished and art deco too. For the fist time, people enjoyed the use of automobiles, telephones, motion pictures and electricity, which brought significant changes in lifestyle and culture. In the twenties the media started focusing on celebrities, especially sports idols and movie stars and fashion entered the modern times. The restricting fashions of past years were left and people began to wear more comfortable clothes. With this information in mind, we want you to explore our collection of including some classical outfits like elegant Costumes consisting of poly-cotton, black and white pinstriped jackets, matching striped pants and black dickeys with white ties and stylish fedoras. Your boy can dress up for Halloween, school plays or school projects with one of our realistic 20s Costumes. If you need help selecting the best option from this period or alcohol prohibition and notorious crime, we can help you browse and find the perfect outfit for him. The ideal accessories for the 1920s Boy Costumes are fedora hats (different colors available), toy weapons and fake money props. Enjoy this Halloween with a special fashion look that will make up stand up from the crowd.